As I continue to work furiously on my upcoming Etsy shop, I find myself taking more and more long baths to soak my sore muscles and brainstorm. When I saw this tub today, it inspired another thoughtful soak which led to a fantastic Etsy breakthrough! I would love a bathtub like that one. I could use a good soak after the past week over here! Looking forward to seeing what your bathtub epiphany was! i'm more of a shower person, but the bathtub, the view! i just may convert. I can't wait to see your shop! 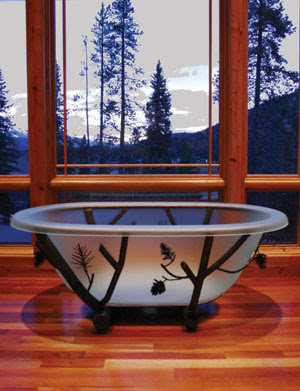 what a cool looking tub! however, not sure how comfortable it would be..maybe that's just me..
Sign me up! That bath tub and view...amazing! Darling thanks for visiting my cottage and for the kind comment you left behind, much appreciated. This truly is a lovely tub and one that I need right at this moment. I wish you the best in your upcoming home transformation, I am certain it will turn out simply divine. I want to go to there! Right now!